Perhaps you’ve heard the old saying: “Take care of your dentures and your dentures will take care of you.” Well, maybe it’s not that old—but it’s still a sensible notion. Maintaining your dentures by routinely cleaning them and having them checked for fit will improve their longevity. There’s one other thing you should include on your maintenance routine—avoid wearing your dentures 24/7, especially while you sleep. This bad habit could lead to some unpleasant consequences. For one, wearing dentures continuously can accelerate bone loss in the jaw that eventually causes your dentures to lose their comfortable fit. Bone loss is a natural consequence of tooth loss because the bone no longer receives the stimulation to grow transmitted by the teeth during chewing. Dentures can’t transmit this stimulus; what’s more, the pressure they place on the gums and underlying bony ridges could make bone loss worse. You can relieve this gum pressure at night by taking them out. Dentures can also become a breeding ground for bacteria and fungi that cause disease, irritation and unpleasant mouth odors. Taking dentures out at night deprives these microorganisms of a prime opportunity to carry on business as usual—and it’s also a great time to clean your dentures. 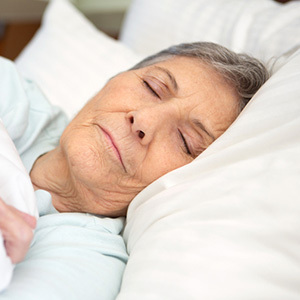 People who sleep with their dentures in their mouth are more likely to have gum or oral yeast infections and higher levels of proteins produced by white cells that increase inflammation. That could contribute to other diseases throughout the body. Besides taking your dentures out at night, you should also practice other daily hygiene tasks. Remove your dentures after eating and rinse them with clean water. Brush your dentures daily with a soft-bristled brush and dish or antibacterial soap or dental cleanser (no toothpaste—it’s too abrasive for denture surfaces). Be sure you clean your gums and tongue every day too. When your dentures are out, store them in clean water or preferably an alkaline peroxide-based solution. Removing your dentures at night and these other good habits will help extend the life and fit of your dentures. It could also help keep the rest of you healthy. Could Invisalign Help My Smile? Broken Dental Implant? Now What? Do You Want A New Look Without A Lot Of Hassle? How Fillings Can Make My Teeth Strong and Healthy Again? How Bad is it to Miss One Six-Month Cleaning? What Are Veneers Made Of? Why Don't You Chew on This?